Whare Ra differed from the other Golden Dawn groups because of a little ritual called the Etheric Link. The ritual was given out after the 7=4 and was supposed to provide a direct connection to the Rosicrucian current. The Link ritual was obtained by Robert Felkin from Rudolf Steiner when the latter was still a Rosicrucian. There are several theories as to where Steiner obtained the ritual, which are historically interesting, but not the subject of this article. I am more interested in what the Link does and what it represented at Whare Ra. Please note that these are my ideas, and are not official and are up for debate. The Golden Dawn writer Pat Zalewski once said that the Etheric Link ritual represented the end of a process which started in the 0=0. There the candidate is linked to the current as part of the rite. It is strengthened at each initiation and always as part of the egregore of the order. Finally, in the 7=4, the candidate gets their own version of the link which is independent of the Order. In theory, this means that the candidate can form their own order, or go off and do their own thing. Note this does not mean that they are allowed to go off and form another Whare Ra temple. That required a note from the chief of the order, a note from their parents, and at least three forms of ID and a utility bill. Golden Dawn researcher Tony Fuller has said that in different periods of Whare Ra history the Link was given only to chiefs or those who might one day become chiefs. However, the link later was given to others normally after the 7=4. In fact we have evidence of this in the form of the two great initiators of the post-Whare Ra adepts Frank Salt and Jack Taylor who were not order chiefs (however senior they were in Whare Ra) but had the link and did pass it on to their students. Tony Fuller has found evidence that the Felkin used to give the link out at any point in the second order where the candidate needed it. (Often at 5=6) although he did give it to Westcott at 6=5 (he also gave him the 5=6 and the 7=4) . At some point it was bumped up to 7=4 with Jack Taylor referring to it as a capping off process. This could suggest that either the later chiefs felt it too powerful for a 5=6 and/or discovered something new about it which Felkin either did not know or had not spotted. So the question is what IS the link and what did it do? Felkin believed that the ritual gave the candidate an etheric link to Christian Rosensenkreutz so that the person became his “son” and “spiritual heir.” This is a spiritual leadership role within the Rosicrucian movement. CRC was the initiator and the creator of the Rosicrucian Order. So in many ways it was the right to initiate into the Second Order of the Golden Dawn. This provided Felkin’s order with a Rosicrucian connection which gave it legitimacy. In this context, it was important for Felkin who needed to establish a Rosicrucian link which was better than whatever it was that Mathers was offering. While it is possible it is unlikely that the link was written by Steiner and may have some connections with earlier masonic/Rosicrucian bodies, what the physical link ritual did became irrelevant. It is the nature of magic that something which appears as one thing can be transmuted over time into something else. New Zealand was disconnected from the European occult scene and here was a ritual that patched its adepts into the Hermetic and Rosicrucian current – the Western Mystery Tradition. To the adepts who accepted the link it became something else. It was not going to provide them with the authority of lineage, at least not in the sense that a mason would understand it. But then, they did not need it – they had Whare Ra and that was not really going anywhere. Firstly, it gave them the power to initiate into the second order. When you perform a second order initiation you have to make several connections at the same time. You have to connect to the egregore of the second order and also the divine. The Godform of CRC acts as an intermediary between these two forces, forging a chain between god, the order and the candidate. The connection with CRC represents the Rosicrucian tradition and the position as a son of CRC enables the initiation to take place. 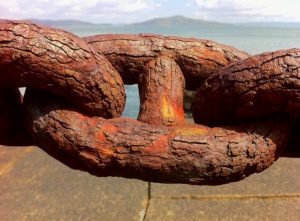 This chain though is connected through history and not just Rosicrucianism, but all those orders and magicians which gave birth to that particular movement. One initiate’s experience of the link ceremony was that it opened up a vortex in front of him, like a time tunnel. Another person told me that they felt the link was like a long huge Akashic library in which all occult knowledge was written. A book was each adept’s contribution to the Great Work. Another who was less impressed with his experience said he had the impression of the age of an ancient tomb and a person who was old was watching him. One thing you notice is that the experience of the link is subjective but the symbols are similar – ideas of profound knowledge spanning back over time. Another thing about the link is, like many initiations, sometimes it “takes” and sometimes it does not. If it does not there is nothing bad. The person’s occult work is always focused in service within the order which gives them the link. They do not need to draw on information, or energies which do not come from that. When the link takes there is a desire to research and to create your own contribution to the tradition. To be your own link in the chain. It might be to be a leader, or it might simply be a desire to share your slant on the mysteries with your students. You will train your students until they are ready for you to pass the link onto them so that the Chain of Hermes is never broken. I find it interesting that you refer to Tony Fuller as simply being a Golden Dawn researcher, wherein fact Tony is a senior Adept and has the link handed down From Frank Salt…I think we should refer to you as merely a hobbyist writer on The Golden Dawn then. I have known Tony since I was 17 and we were in the same order together (twice). I have complete and total respect for him. I call him a Golden Dawn Researcher because that is the hat he is wearing when I am quoting him. It is also polite. Whare Ra people, and those who took initiations from them do not talk publicly about their lineage, initiators, name of temple etc they regard it as poor taste. So you can be talking to someone who has a Whare Ra connection and they will not mention to you how they got what. Never trust someone who say they have Whare Ra “lineage” the concept is an absurdity. I have met several people who claimed Whare Ra lineage and they are usually the frauds. Over the years I have “picked up” Tony’s history but he never officially told it to me. That is how those with a real Whare Ra connection work.